Confession? I find meatballs a bit annoying. After all, mixing, shaping, baking, etc. can take a bit of time. Then there's the whole thing of being wrist-deep in a bowl of raw meat and egg that just brings out all my latent OCD feels. Seriously. I hate having my hands dirty with food. I go through about 8-10 paper napkins in an average fast food dinner or pizza night. I usually have to hide them out of sight because the only thing grosser than someone with food all over their hands is someone with a pound of grease and ketchup-stained paper napkins balled up next to their plate. IMO. Anyway, kids love meatballs, and they're great for packing weekday lunches. My solution? Meal prep a mega batch o' balls so I only have to mix, shape, bake once and we've got protein for dayyyyyyys. I've been playing around with different proteins. Beef is the meatball I grew up with, but lean beef can be, well, tough. Sorry, mom. Pork and veal are lovely but fatty...delicious but maybe not your everyday meatball. Finally, I've found it. Funky in its raw state, somehow tender and delicious in its cooked state: turkey. I've resisted using ground turkey much in my cooking over the years because there is just something about that squishy, watery, pinkness. I hope I'm not turning you off. 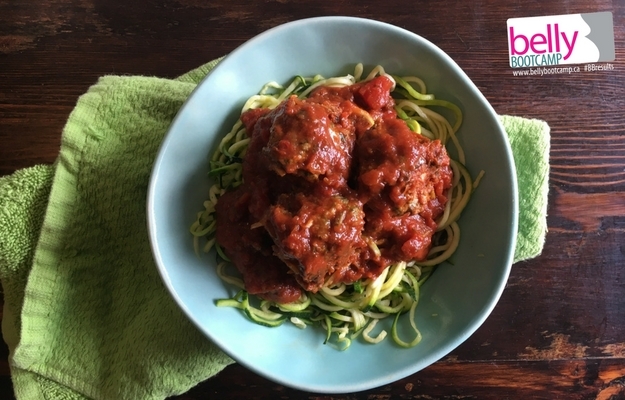 These meatballs and these amazing Mini Turkey Meatloaves have won me over to the turkey team. I'm converted. What more could you ask? Hope you like them as much as we do! Whip up a big batch of these tender morsels for dinner & freeze some for another night! Preheat oven to 450 degrees F. Line a large baking sheet or two regular baking sheets with parchment or aluminum foil. Chop or tear bread into very small pieces and combine with milk. Mix and set aside. Thaw spinach about 5-6 minutes in a microwave, breaking up with spoon periodically. Wrap spinach in clean kitchen towel and gently squeeze to remove excess moisture. Let cool slightly. In a large bowl, lightly beat eggs. Add grated onion, minced garlic, herbs, salt, pepper and spinach, combine well. Roll into balls or use an ice cream scoop and a second spoon to help you create balls/mounds. Keep balls from touching each other. Allow to cool slightly, then add to your sauce or cool fully, then refrigerate. * Don't be too rough or you'll toughen the meatballs. You should still see bread and spinach poking out and it's OK if not every meatball is perfectly uniform. ** Baking time is approximate since ovens, and exact meatball size, vary. Don't overcook the meatballs, especially if you plan to serve them in a sauce, as they'll continue to cook when warmed in the sauce. Turkey should be cooked to 165 degrees F for safety.